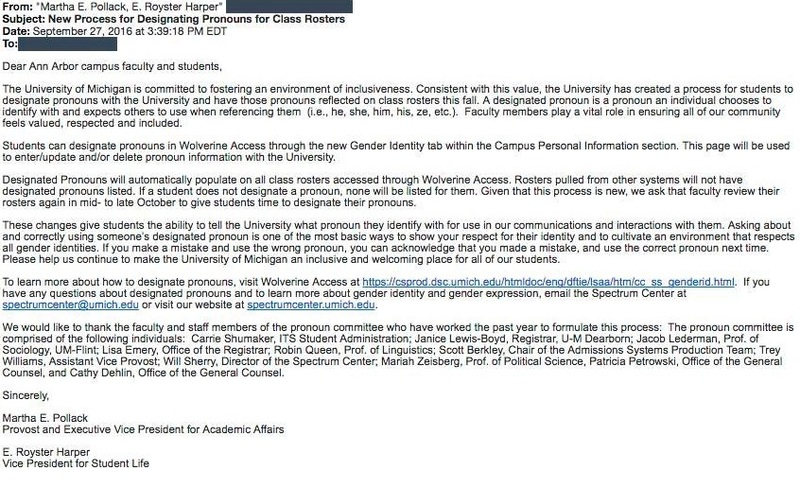 A conservative student at the University of Michigan has fairly brilliantly subverted a new campus-wide policy intended to force professors — and the entire campus community — to use exotic pronouns to refer to students who insist they belong to some alternate, fictional gender. Strobl was able to announce his new pronoun because the taxpayer-funded school launched a new web page allowing students to declare their preferred, “designated” pronouns. Strobl described the email allowing students to designate their identities as “absolutely ridiculous” in an interview with The Daily Caller. “It’s our jobs as conservatives to keep this country sane,” Strobl also noted, adding that he believes other students “are starting to change their pronouns” in ways school officials likely failed to anticipate. “I encourage all U-M students to go onto Wolverine Access, and insert the identity of their dreams,” he told The College Fix. Omar Mahmood, a 2016 University of Michigan graduate currently working at USA Today, suggested that he shall henceforth be called “Mr. Grand Mufti Sir” by his alma mater. A Twitter hashtag — #UMPronounChallenge — now exists to lampoon the University of Michigan’s new “designated” pronouns policy. “Asking about and correctly using someone’s designated pronoun is one of the most basic ways to show your respect for their identity and to cultivate an environment that respects all gender identities,” the email pontificates. The Gender Identity tab allows UM students to change their pronoun to whatever they wish at any time, opening up the possibility that a student could demand a new pronoun every single day.